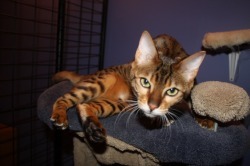 Taj & Rahni arrived here from Beckatt bengals as desexed pets. 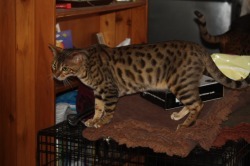 They are the first bengals I have ever owned. They are funny, active, athletic, and affectionate. They have access to an outdoor enclosure 24/7 and they love to climb, jump and play in their water feature. 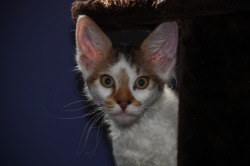 Archie is my first LaPerm cat and he is unlike any cat I have ever known. He is very ‘dog like’ in many ways. He plays fetch, comes when called, and follows me around the house. Archie sleeps with me every night and I cannot imagine life without him now. 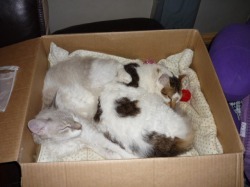 LaPerm cats are still a relatively new breed to Australia. 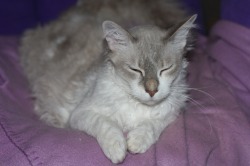 Information about the breed can be found at Frisson. 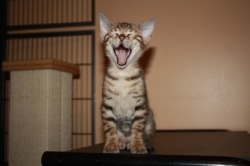 Archie came to Karindi as a tiny 8 week old kitten. As with all my cats Archie is desexed and lives indoors. 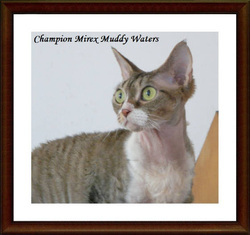 Muddy came to me at 4yrs of age, as an ex breeding queen from Mirex devon rex. Living with Muddy is like living with a small furry alien. She is the funniest cat, she comes running when she is called, wags her tail like a dog, does funny things with her front paws and makes a range of funny little sounds. 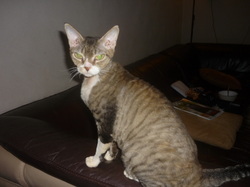 Mudds is a joy to live with and I am now smitten with the devon rex breed. She is very doglike in many ways. Holding her is like holding a living hot water bottle, they are very warm to the touch because of their coats being so short. Devons are highly intelligent and do not shed, so they are perfect for people with asthma such as myself. 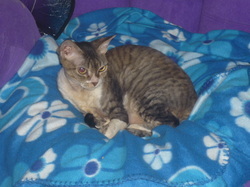 Quincy is my 2nd devon rex from Mirex. He is the cuddliest cat I have ever known and his goal in life is to snuggle up to the nearest human body. He comes when called and is a lovely snuggly sweet boy. 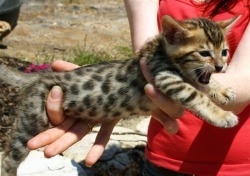 He is still a kitten at 5 months and is still very playful and has lots of energy. I look forward to many years with this beautiful boy. After falling in love with Archie I decided my household could fit another cat in. 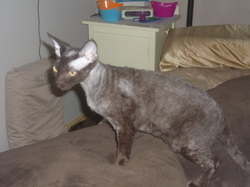 So i contacted Frisson asking for a young desexed adut male cat that may be suitable. Several weeks later Zani arrived. 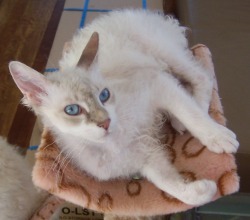 Being a pointed cat Zani has stunning blue eyes. He has fitted into the household perfectly and it feels like hes been here forever. Zani is playful and cuddly and also sleeps with me every night. He gets along with the dogs and the other cats. Zani & Archie are now best mates and are always together.